Hi there! 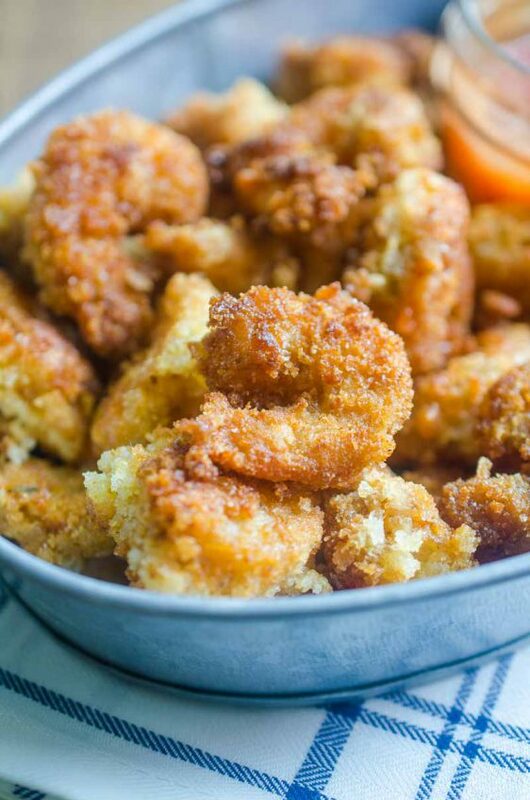 Meghan with Cake ‘n Knife here, bringing you some perfectly golden fried shrimp deliciousness to get you through the week. 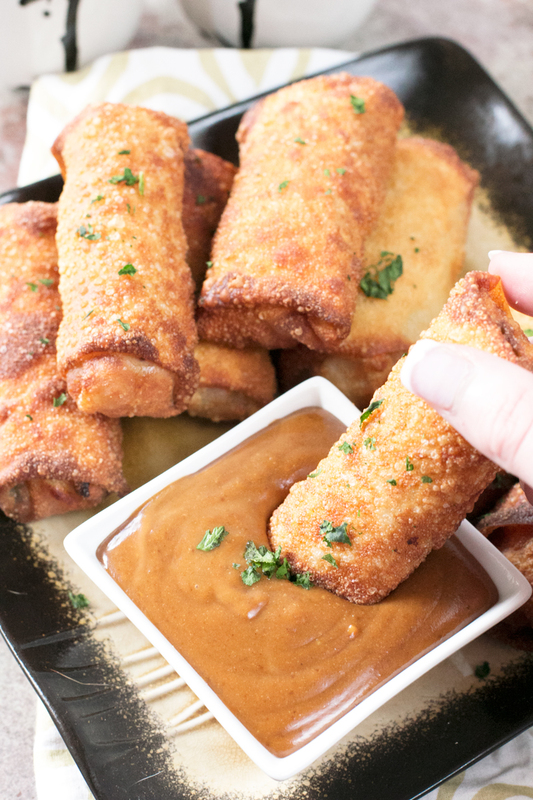 Shrimp Egg Rolls with Spicy Peanut Dipping Sauce. I have to admit something to you all… I am deep in an egg roll obsession right now. I’ve been stuffing those egg roll wrappers with everything from meat to seafood to vegetarian goodness and the hits just keep on coming. Lately it seems like I’m on a roll with endless ideas of what to fill egg rolls with. I’ve done it all, but today I’m taking a break from the crazy wacky and weird ideas that go through my head to bust out a classic for you. When I was young, my dad and I got Chinese takeout all. The. Time. It was kind of our thing, with tons of Diet Coke and movies that I probably shouldn’t have been watching at eight years old… Yep, my dad knew how to kick back and be the “fun” parent whenever he wanted to. The Chinese place we used to get food from had these shrimp egg rolls that they served with this spicy peanut sauce that I would go bonkers over. They were perfectly crispy on the outside, stuffed with shrimp and veggies on the inside, and I could devour at least 6 in one setting. 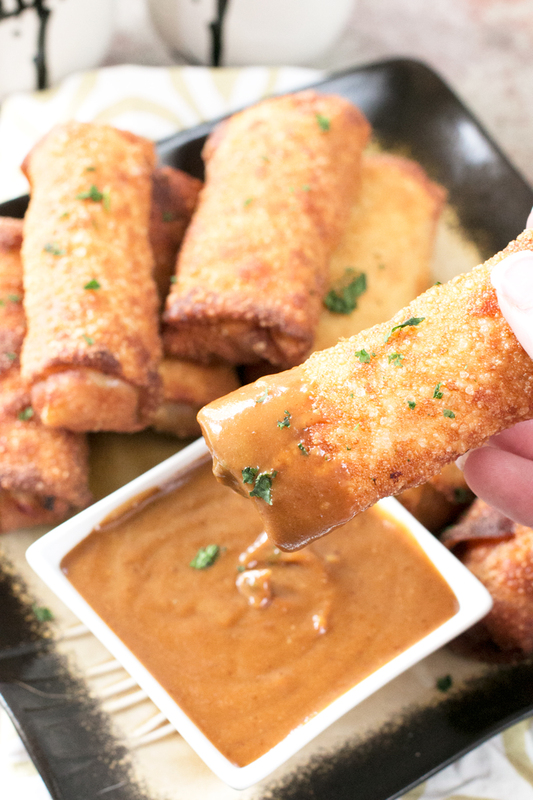 I didn’t really think about those egg rolls until the other day when I was making some cheesecake stuffed egg rolls and started wondering where my obsession began. Then it clicked, I haven’t even tried to make THOSE yet! These egg rolls are exactly how I remember them, if not a little better because I’m sure the stuffing from that Chinese restaurant was only cabbage, shrimp and a little soy sauce. 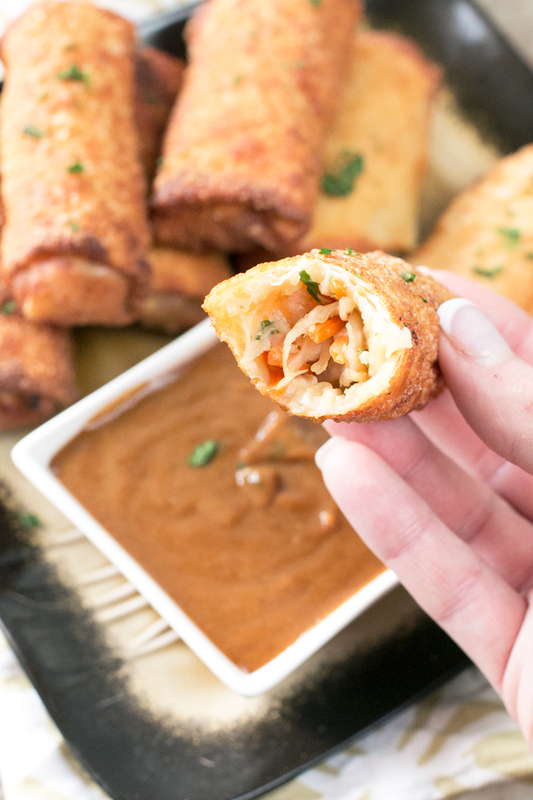 My shrimp egg rolls are bursting with flavor and the peanut dipping sauce is not only going to blow your mind, you’re going to find yourself making it and putting it on eve-ry-thang. 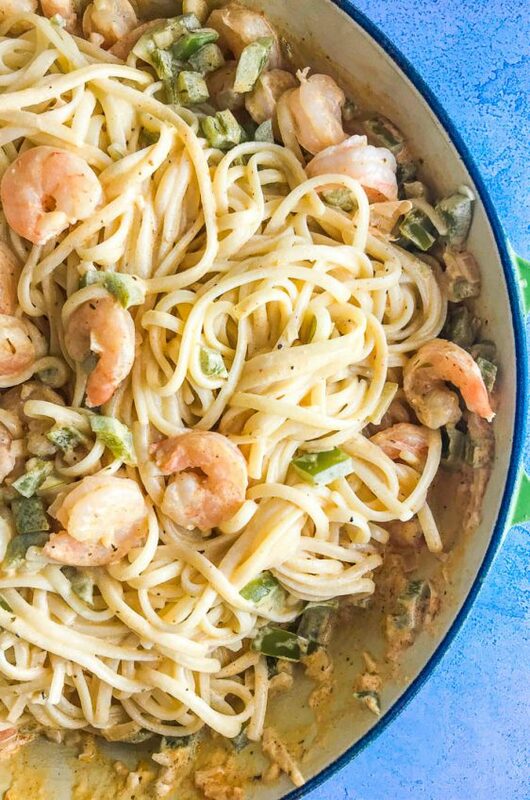 So the moral of this whole story is… you should definitely treat yourself and your family to this gem of a recipe. You won’t regret it! In a small bowl, whisk together ingredients for the sauce. Set in the fridge until ready to serve. 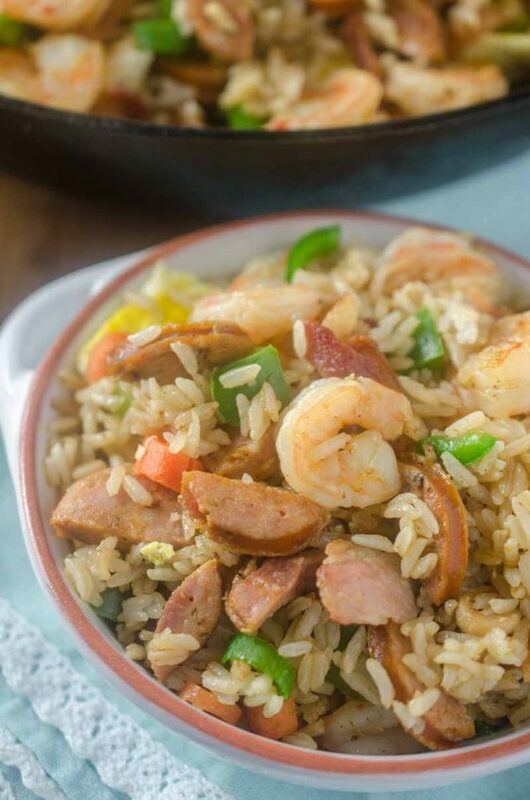 In a large bowl, stir together ginger, cabbage, carrot, salt, scallions, sesame oil, miring and chopped shrimp. In a separate small bowl, whisk together cold water and cornstarch. Start with a clean, flat surface. Lay one wrapper so one of the corners is facing you (like a diamond). Dip your fingers in the cornstarch water and spread on each edge of the egg roll wrapper. In the corner closest to you, add approximately 1 1/2 to 2 Tbsp of the shrimp mixture. Lift the bottom corner up and begin to tightly roll away from you, making sure you tuck the corner under as you roll. Once you are halfway up the wrapper, fold in the left side and then the right side towards the center. Finish the roll and brush a little more of the cornstarch mixture along the outside of the final seam. Place seam-side down on a sheet pan or clean plate. Fill a pot with 4-5 inches of cooking oil. Heat the oil to 350 degrees. Gently add the egg rolls to the hot oil, frying no more than 3 or 4 at a time, turning occasionally. Fry until the egg rolls are golden brown on all sides, approximately 2 minutes total. Place on paper towels to drain and cool. Serve immediately with peanut dipping sauce. Oh YUM! 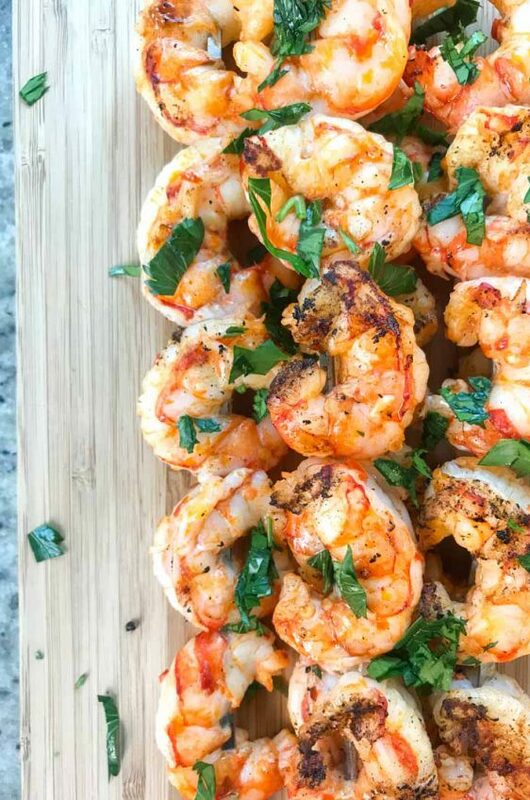 These look seriously delicious….and I love the sauce! These looks awesome — My family would love them! 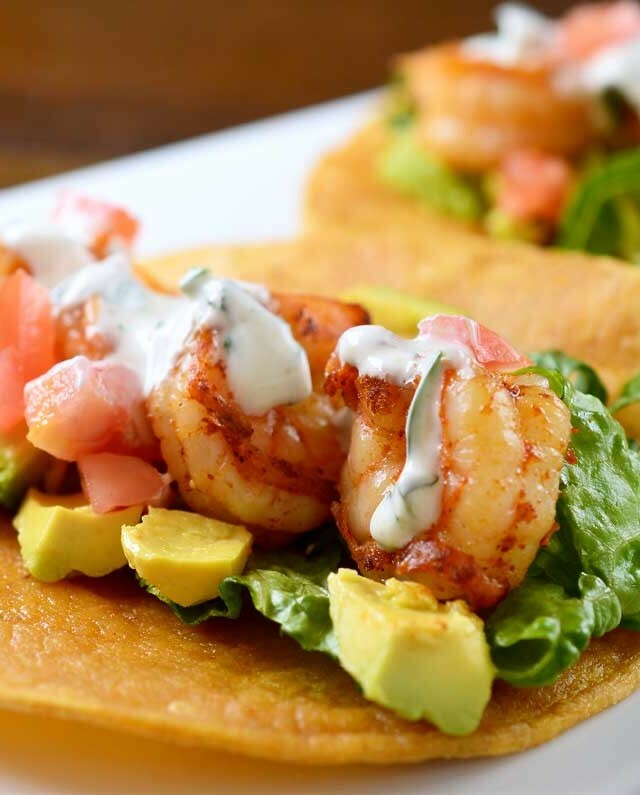 Oh my goodness, these look amazingly delicious! Pretty sure these would be gone in no time at my house! They look fabulous! These rolls look and sound amazing. I love this! I love the sauce that goes with it! seems no way to get the recipe. 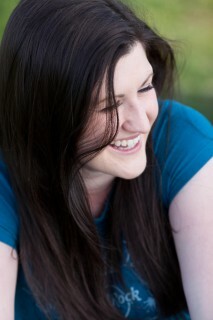 beautiful pictures though. 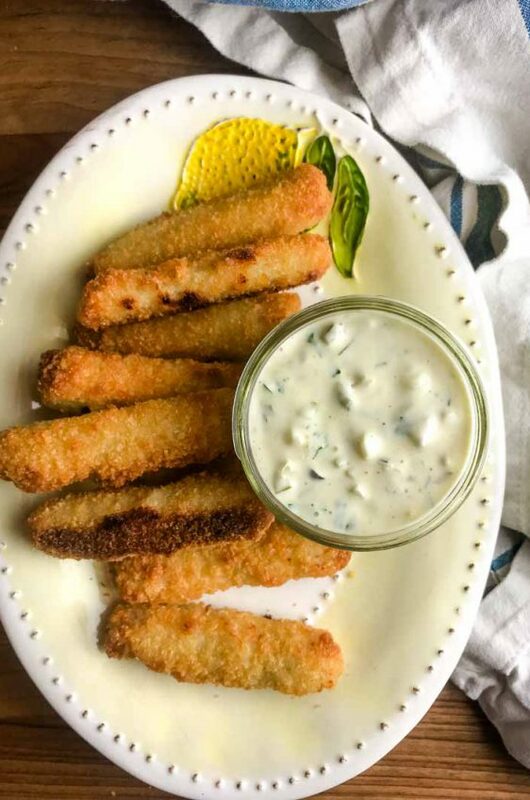 I am totally craving these now and that dipping sauce…it looks awesome!